Rock of Aphrodite (also known as "Petra Tou Romiou") is a scenic location on the Cyprus coast. 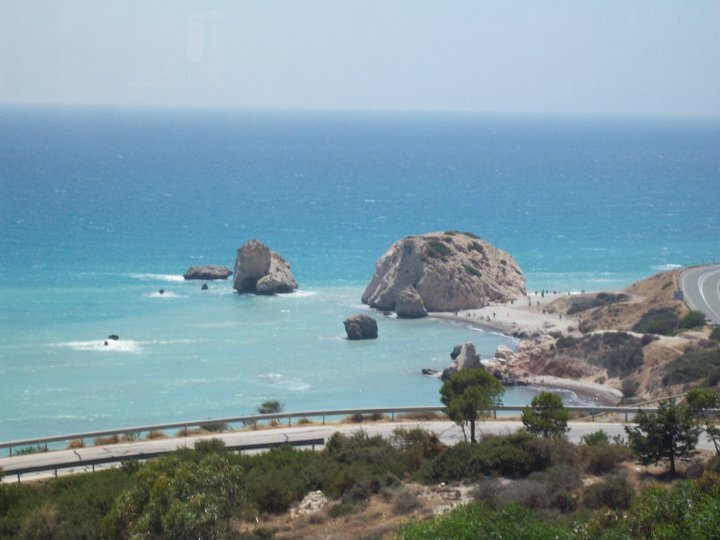 It can reached on the B6 road between Paphos and Limassol. The rock marks the location where Aphrodite, the goddess of love and beauty, arose from the foaming sea. This legend states that at that time there existed Gaia (the goddess of the Earth) and Ouranus (Father Sky). On her instructions, one of Gaia's sons, Kronos (who was the youngest of the Titans), mutilated Ouranus by cutting off his testicles and throwing these into the sea - which caused the seas to foam and then give birth to Aphrodite. Digenis Acritas, a Greek-Syrian Christian hero threw a large rock to destroy invading Arab-Muslim ships. It is from this legend that the rock gets its second name, Petra Tou Romiou, which means "Rock of the Greek". By the site of the Rock of Aphrodite is a tourist kiosk/pavilion. Additionally, on the hills above the Rock is a restaurant which has a spectacular view of the area. 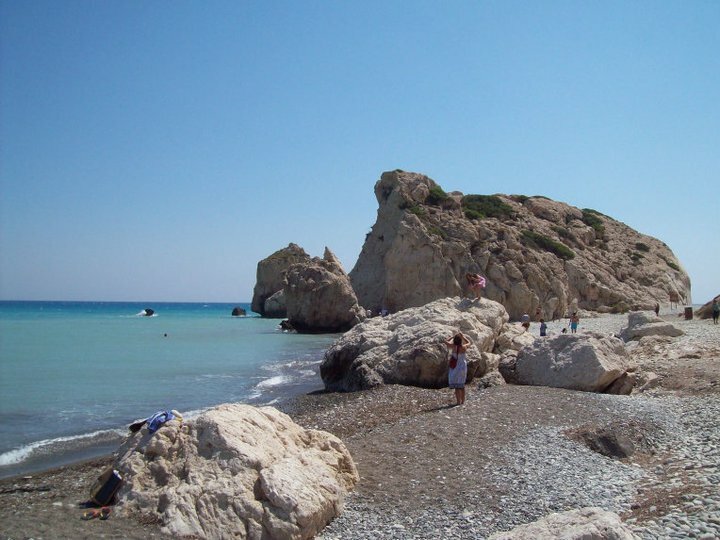 I have been to the Aphrodite Rock at least twice while on holiday in Cyprus. 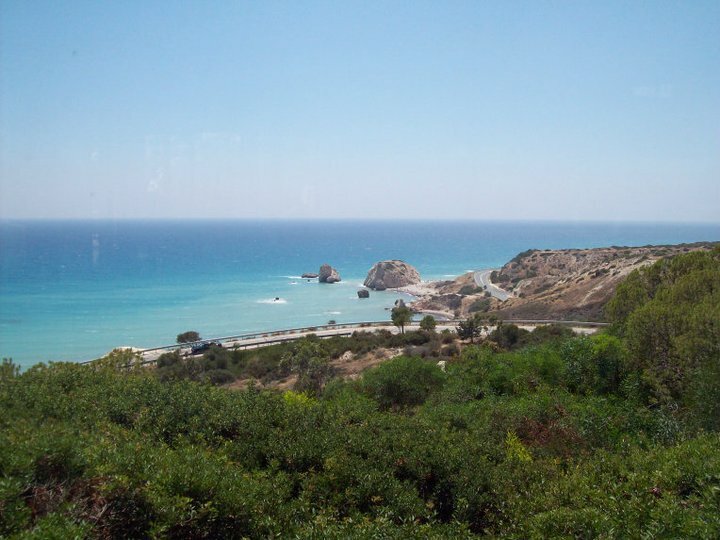 It is easy to find, simply drive along the B6 road southwards from Paphos towards Limassol. The drive is quite scenic in general, but the view around the rock area is quite special. If you are driving southwards on the B6, you will see the sea and the rock on your right, and just after that, on your left is a kiosk/tourist pavilion with a large parking area. The kiosk is useful if you need a drink or an ice-cream! Beside the kiosk is a fairly-steep flight of stairs, which leads to a narrow tunnel that goes under the road to the shore - you may need to carry small children, but fortunately the distance is not too far. The tunnel emerges on a pebble beach just to the South of the rock, and there are often people swimming or sunbathing in this area if the weather is good. You can have a swim or sunbathe if you wish, or walk around and look at the rock - you can get to the beach and sea on the other (North) side too, but the sea tends to be a bit rougher there, although the beach on that side is slightly less rocky. Climbing on the Aphrodite Rock is forbidden (although you often see people doing it), and there seem to be local traditions associated with the area (I noticed many bits of paper or plastic tied to bushes in area - perhaps a way of making a marriage wish?). My wife and I made a heart with our initials from pebbles on the North beach, but I doubt it's still there! Just a bit further to the south along the B6, is another side road going up a steep hill. If you drive up the hill you'll come to a Greek restaurant which offers some spectacular views. The restaurant also contains a small gift shop, and clean toilets.